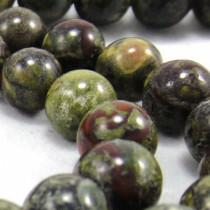 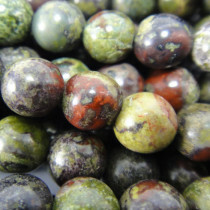 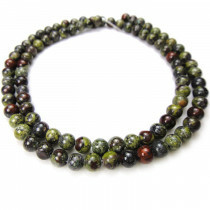 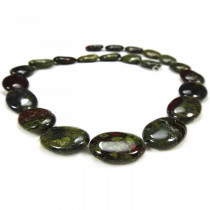 These beads, sometimes called heliotrope, are deep forest green with attractive contrasting red markings. 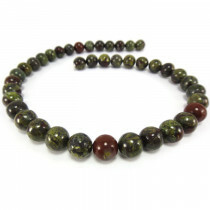 The myth is that, at his crucifixion, the blood of Christ fell on Green Jasper. 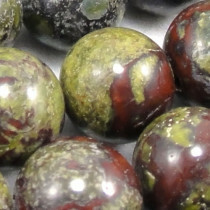 Engraved bloodstone was used by the Babylonians in divination and by the Ancient Egyptians to magically defeat enemies.Good grounding stone with protective qualities. 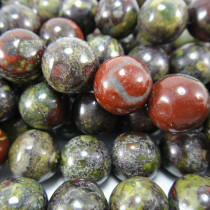 Considered a powerful healing stone, believed to aid balance and renewal. 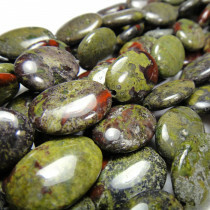 Bloodstone Round 4mm Beads (~100pce Strand) - 40cm /16'" Strand. 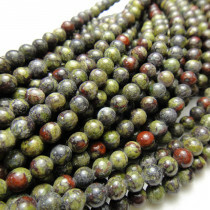 Bloodstone Round 6mm Beads (~66pce Strand) - 40cm /16'" Strand. 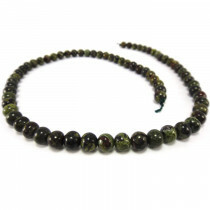 Bloodstone Round 8mm Beads (~50pce Strand) - 40cm /16'" Strand.